This Friday, 8 June, World Oceans Day, a day of ocean celebration and collaboration for a better future is celebrated. This year’s focus is “preventing plastic pollution and encouraging solution for a healthy ocean”. Of the more than 8 million tons of plastic waste that end up concentrated in the oceans’ major gyres each year, more than 60% originates from plastic packaging. Both the large plastic pieces and the microplastics are a thread to marine life, with the microplastics eventually ending up in the trophic chain. 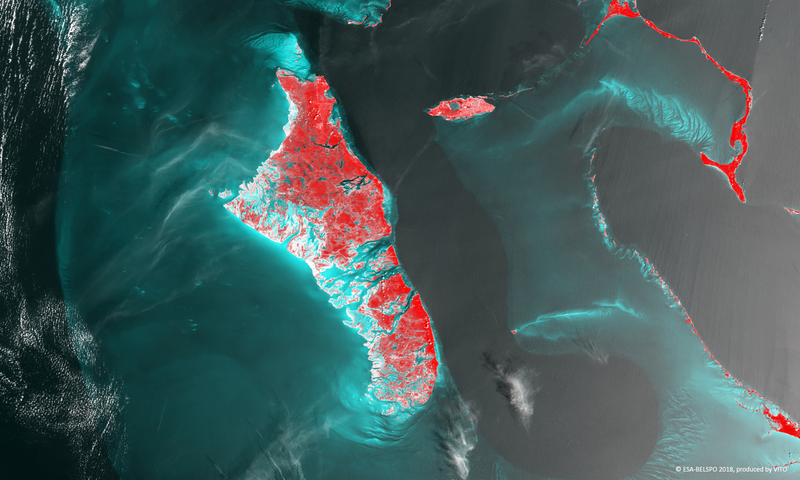 The false-colour 100 m image of 20 March 2018 shows part of the Bahamas archipelago, which has the third most extensive coral reef system in the world. The Bahamas’ major island Andros is located in the image middle part, while east of Andros the small but most populated island New Providence can be seen. In the upper-right and lower-right part, Eleuthera and parts of Great Exuma are located, respectively. The light-blue taints indicate the shallow waters surrounding the Bahamas.